Guess whose father-in-law was the original King of the Blues Guitar? from Texas. By the early 1940s, both were working out of California. when King was 33, was a nationwide U.S. race hit years ahead of its time. 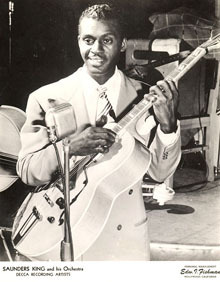 see BluesMuse 12) had a massive hit with Saunders King’s song in 1945, calling it, ‘S.K. Blues’. Jimmy Witherspoon, too, covered the tune as S.K. Blues. Walker’s 1942 contribution will follow soon in BluesMuse 16. Rocking 100 years ago. Amazing film footage.